Leather dark brown hip length coat in supple lam leather. The jacket has a lot of pockets and closes with a zipper and snapbuttons. Read more..
Special bold leather mens jacket in very supple dark brown lamb leather. This hip length model with the four flap pockets is really something else. The zipper at the front goes all the way to the end of the collar. Besides the zipper has this model also snap buttons at the front. De jacket has four pockets with a snap button at the flap. The two larger pockets can also have a entrance at the side. At the left top of the sleeve is a small metal star, the logo of Milestone. The length at the back in the side 52 is 72cm. The smooth lining has three inside pockets, one with a zipper. 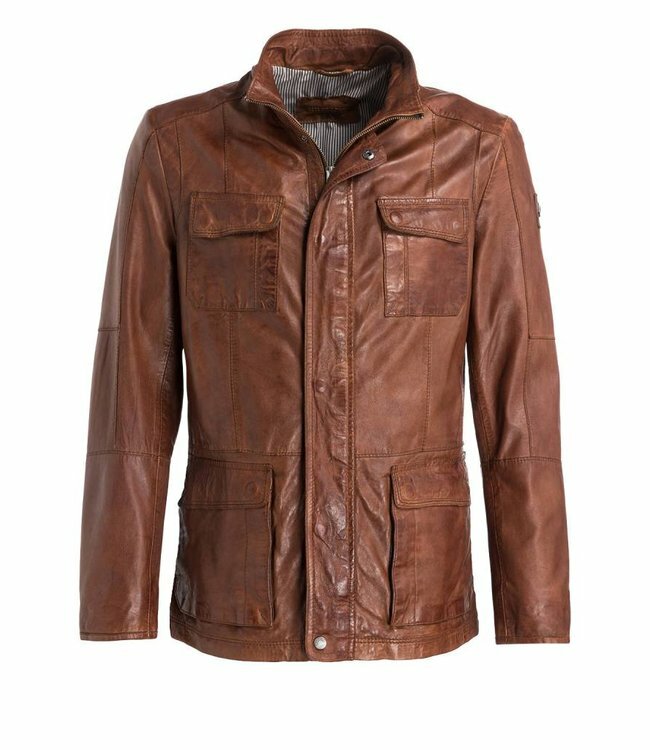 Supple cognac leather jacket with four flap pockets. Zipper..
Leather jeans jacket in awesome grey lamb leather Noriko by ..